The faces that have passed in front of Rory Lewis’s lens seem almost like a laundry list of the admired and the influential. One day he might be capturing images of legendary actors like Sir Patrick Stewart or Sir Ian McKellen, the next he’s photographing David Cameron, or even royalty like Prince Michael of Kent. Though many of Lewis’s images are famous and instantly recognisable, he’s about to be showing off a few that have never been seen before. In a new exhibition titled 'Portraitist' at the Wex Photo Video Gallery on London’s Commercial Road, Rory will unveil 24 never-before-seen images, including shots of high-profile public figures, artists and celebrities. Rory adopts a fresh approach to portrait photography, eschewing stiff poses and cringeworthy concepts in favour of quiet intimacy and a feeling of genuine connection between viewer and subject. Describing his process, Rory said, "So much of the portraiture commissioned in the press and print industry is reluctant to take risks, and I try to challenge that safety. In any commission, I always make sure that I have one moment at the end, which I like to call my ‘dessert’, where I’ve finished my brief and I have that person to myself. You shouldn’t waste your moments. In many of my sittings I only have five or ten minutes, so I have to break the ice with my subject very quickly. I like to keep them in continuous motion and direction in order to capture the movement of their thoughts." And there’s some good news if you’d like to try learning Rory’s style and techniques for yourself – he'll also be hosting a lighting masterclass at the Wex Photo Video Gallery, on the evening of Thursday 9 August. You can make a booking here. 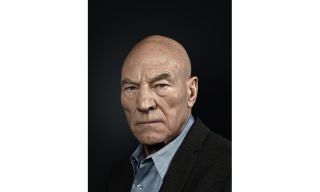 Matt Devine, head of content at Wex Photo Video, said, "We’re honoured to present such an outstanding new collection of portraits in this very special showcase at our London gallery. We hope that Rory’s extraordinary style and approach will inspire other photographers to experiment with their portraiture." The show is being hosted in collaboration with Epson, and limited-edition prints of Rory’s images will be available to buy, printed on Epson Premium Luster media. The exhibition will be running from 1 August to 30 September at the Wex Photo Video Gallery, 37-39 Commercial Road, London E1 1LF. The nearest tube station is Aldgate East. Admission is free, and you can find opening times on the Wex Photo Video website. More details can also be found on Rory's website.